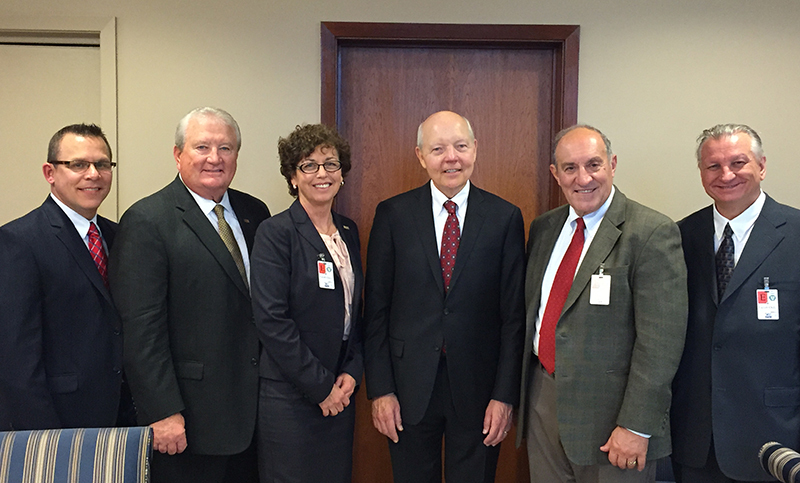 NSA Officers met with Commissioner Koskinen on Novermber 18, 2015. From left to right, Brian Thompson, NSA 2nd Vice President; Curtis Lee, NSA Secretary Treasurer; Kathy Hettick, NSA President; Commissioner Koskinen, NSA Executive Vice President, John Ams; and NSA 1st Vice President, Alfred Giovetti. August 10 discussion will focus on improving services, reducing audit requests during tax season and increasing IRS budget appropriations. Top leaders of the National Society of Accountants (NSA) will meet with Internal Revenue Service (IRS) Commissioner John Koskinen on August 10 to discuss a range topics relating to the services the IRS provides to tax preparers. NSA President Kathy Hettick, EA, ABA, ATP; NSA First Vice President Al Giovetti, CPA, ABA, ATA, ARA; NSA Second Vice President Brian L. Thompson, CPA; NSA Secretary-Treasurer Curtis Banks Lee, Jr., ATA, ATP, and NSA Executive Vice President John Ams will conduct the meeting. Upgrades to IRS phone support and service. Audits and correspondence audits, including limiting such audits during tax season. Suggestions to improve the power of attorney process for tax professionals. Suggestions to improve electronic tax filing services. What NSA can do to support increased IRS budget appropriations. Many of these issues were highlighted in 2015 when NSA issued its Tax Practitioners Bill of Rights that calls on Congress and the IRS to do several things. The rights include passing and implementing tax laws in a timely manner, providing prompt and consistent response to questions by phone and mail in a secure manner with a single IRS representative in charge of reviewing each specific tax issue, and reducing the demands the IRS places on tax preparers during tax season, especially involving audits. “Fortunately, we have a Commissioner who knows how to partner with organizations and professionals and who truly works to improve tax administration for taxpayers as well as tax professionals,” Hettick said. “He is open to ideas, and listens when people speak. We brought forward the Tax Practitioners Bill of Rights last Fall in our meeting with the Commissioner, and it was well received and understood. Thompson recounted two instances this year and last year when the IRS required him to respond to audit requests late in the tax filing season, including one request to conduct a tax return audit for a client with an IRS representative on April 15, 2015. These are just two examples of the types of issues that tax practitioners across the nation face on a regular basis. “We hope that the Commissioner listen carefully to our concerns in this area and reduce this onerous burden on tax preparers during tax season,” Thompson noted.